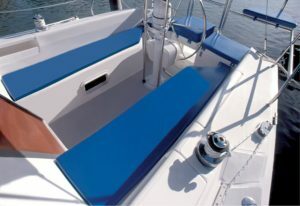 If you own a boat long enough, eventually, you’re going to want to replace a boat cushion or two. Foam flattens out over time, and many people buy boats used so odds are good your cushions already got some use before they ever came to you. When you want to make custom cushions, you have no shortage of potential foams you can use for the task. The standard foam is polyurethane, but like memory foam, it’s ill suited to the task. Polyurethane doesn’t usually have the firmness you want, and memory foam would soak up water and moisture, in addition to heating up in the sun. Latex is an acceptable substitute, but your best bet is open celled foam. This type of foam has open cells that prevent moisture build up, which is great for something in contact with water basically 24/7. Those who store their boats at home will also appreciate that these types of cushions float. While you never want an accident on the open water, it’s good to be prepared. It’s also important to note that there is a difference between density and softness. You can have extremely dense foam that is very soft to the touch and provides a lot more support. It might be a good idea to keep cushions designed for flotation mixed with cushions designed for comfort, just make sure you use a good waterproof canvas material to prevent the foam from soaking up too much water. Soaking up water can make them difficult to clean, and will lead to mold buildup and smelly cushions after a short time. Based in Southeast Michigan, Foam Factory, Inc. is a distributor and manufacturer of upholstery foam to Canada and the United States.